We left Beijing with a twinge of sadness. As you have read, we loved the city and all it had to offer. The next couple of days were a whirlwind of old town walls, trains and temples! We decided to try the ‘hard sleepers’ on the next two trains. We opted for the middle (of three story high bunks) bed within the 38 bed bunkhouse on the train – imagine rows and rows of bunks and you are not far wrong! We had read mixed reviews about these sections and so far had avoided them. However we were so pleasantly surprised with the first journey to Pingyao, that we booked the next train in this style too! With our valuables as a second pillow, we felt perfectly safe and slept like babies (on a good night!). Now I should say booking trains in China is in itself not for the feint hearted. As the Lonely Planet says, the booking system is the “Achilles heel” of the whole train network. You need to buy your ticket at the station or ticket booth, the further in advance, the better (we have met some travellers who have been ‘stuck’ for a few days as their desired train was full). The early bird definitely does catch the worm. Needless to say the ladies at these ticket booths rarely speak English and it is a cash only system for westerners. The odd hostel can do it for you, for a charge, but not many. We had taken to looking up trains, deciding what we wanted and then asking the hostel to write us a note in mandarin detailing our request. We then headed to the ticket booth and thrust this at the ticket seller and hoped for the best. We have got this far so it obviously works! We made it into Pingyao and checked into our dodgy little hostel for the day and set off to explore. Now the atmosphere here was odd. In the summer it may be more bustling, but it was like a ghost town in winter! The main reason we had come was to walk the town walls – famed for being one of the most intact old city walls in all of China. Quite a statement. We were impressed with what we found, and set about walking the 6km route all the way around them. It took a while with photo stops to look over the roof tops, but it was an enjoyable walk. Our ticket also granted us access to the Confusion Temple and other sites in the city – all worth a wander with the relative sanctuary of being by ourselves. We finished our stay in Pingyao with a walk round at night. It was beautifully lit up with red lanterns everywhere. It was just stunning – needless to say a few hundred pictures were taken during our short stay! It had been well worth the pit stop. It was time for our back-to-back night train to keep on moving. Next stop Xi’an. Xi’an surprised us. Both in size, style and sophistication. As we walked the 3km from the station to our hotel (seemed like a good idea at the time and we hadn’t discovered the 10p bus at that point!) we quickly learnt it was a big city! We checked in, and caught the first public bus out to the Terracotta Warriors. Dad had taken me to see some of the warriors on tour in London back in the 80’s. No doubt the historical significance was a bit lost on me then, and if I’m honest I still couldn’t get my head round the age of these warriors. I can only describe the sight of them (in Pit 1 at least!) as truly amazing. Each one has a different face and lined up in rows they are quite magnificent. What I hadn’t realised was there are still excavating. This was going on in front of our very eyes which was interesting to see. Between us we got some great pictures – something that you are begging to see is a bit of a theme of our trip – photography! It would be fair to say that the Warriors appealed to the history nerd in Dean. Not only how randomly they had been discovered in 1974 but also how they had remained underground for over 2000 years. This was a big thing he had wanted to see and I must admit it is hard not to be impressed. We had read various reviews about what way to view them, and found that visiting the ‘pits’ in the reverse order worked well for us as we finished with Pit 1, the largest of the three and the image you have in your mind when you think of them. An army of warriors in various states of repair lined up in rank and file to guard the Emperor. Quite a sight! Back to Xi’an and something struck me about this city. I deemed it the ‘Paris of China’ when I walked past the row of Maserati’s and Bentley’s parked along the main street. With Expensive Swiss watch shops and swanky clothes stores it was only when we were up on the old city walls at dusk starring down the Champs Elysees of Xi’an, towards the Bell Tower which was all lit up that this came to me. Have you been to Xi’an? Do you agree or disagree? There was clearly a lot of money in this city (as well as poverty) and the friendly people walked about with style and sophistication in the main. We were once again the focus of intrigue and photo requests. I have never been anywhere where I had been this much of a curiosity! Maybe it was our matching wooly hats!! We had a great couple of days there going into the Drum and Bell Towers, and cycling around the old city walls. Our top tip is to go up there in the late afternoon then you can hire bikes for when the city is lit up as well as when darkness falls and all the red lanterns are turned on. It was fabulous. As Christmas approached it was time to move on and try and sort out our Christmas trip. We took an overnight train to Chongqing with the sole aim of getting on a cruise boat down the Yangtze. We were open to offers…. Although secretly we both had a bit of luxury in mind!! We arrived at a hostel with a good travel desk and set them on the case. This was on the 22nd. They quickly came back with the options – we either left on luxury 5*+ cruise that night or we literally missed the boat (and Christmas) until the 27th. Working out the comparisons with a Chinese boat, we decided it represented far better value to ‘posh it up’ for a few days. Hostels in China had been great, but we were at the end of a three weeks stretch without hot hot water and we were in need of a good scrub. We paid our money (a bargain price) and killed the afternoon in Chongqing. It was a bustling city with a mass of building activity going on. From what we saw we weren’t sorry to be leaving later that night! I bought a “cute” (according to the boat staff!) Santa head band and armed with our stuff we walked down and boarded the boat. This was the start of an amazing four days / three nights – wow. The Chinese dragons danced as we got on board and we were met with the glistening atrium on the Century Emerald, complete with Christmas decorations galore. I had died and gone to heaven compared to the last few weeks’ accommodation. Now the older I get the more I seem to aspire to this type of accommodation!! I blame Dean…. I mean I have been lucky enough to stay in many a posh hotel with him, so it is what I’m quickly becoming accustomed to!! We went up to our room, complete with River View balcony and lounge area and made ourselves at home. We put up our Christmas decorations and put our £5 secret Santa pressies for each other under our Russian tree and ‘de-backpackered’. The next few days for us involved several cocktails and watching the Yangtze go by. We had three included visits along the way which we made the most of including the ShiBao Zhai Pagoda (which clung to the rock for dear life), Shennong Stream where we switched to a smaller more accessible dragon boat and the Three Gorges Dam which was interesting, sad and fascinating all at the same time. Out of 200 people on board, we were seated with one South African and six Australians – together we had such a laugh. We could not have asked for a nicer group of people to spend Christmas with – culminating in the boys and girls each singing Karaoke like locals on Christmas Eve! The weather was typically cloudy and misty for this time of year. That didn’t matter. 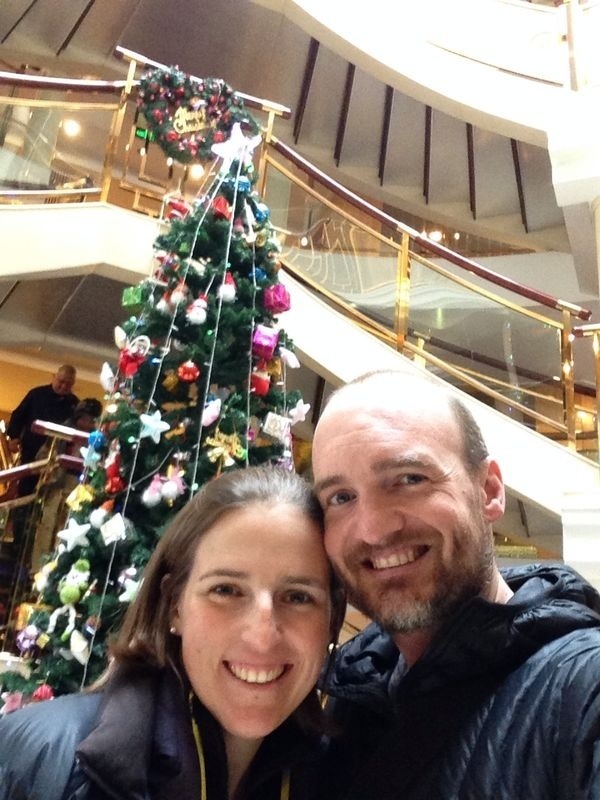 I wanted to be on the Yangtze for Christmas and it was everything and more than we wanted. Backpacking is amazing, and I wouldn’t do trips like this any other way. Sometimes, just occasionally, you appreciate a little holiday from it, and this just totally recharged our batteries and made us raring to go again. At the end of the cruise, we said our fond farewells and took our night train from Yichang to Chengdu, sharing a cabin with a Buddhist monk no less – what a way to spend Christmas, but it was time to look towards the Great Pandas….. More in the next chapter!